It has been said that history is the chronicle of the winners and I believe there is some truth in that. In the Torah (Pentateuch to Christians) we see Moses, Joshua and David winning great victories for the Hebrews, often the underdogs. They are credited with having God on their side and so their victories are less those of strategy and more those of being “chosen” by God to carry out his will. This is indeed a recurrent theme throughout all civilizations and ethnicities when it comes to warfare. The mythology that grows around warfare is not one army’s defeat of another, but how individuals from the victorious army won through an almost “divine” intervention that gave them the skills to succeed. The heroic portrayal of “saintly and heroic” individuals is called hagiography. While originally it referred to the glorification of “Saints”, the realities of the false histories produced through the ages of heroes proven to have “clay feet”, has added a more jaded and more prevalent definition of the word. “as a pejorative reference to the works of biographers and historians perceived to be uncritical or “reverential” to their subject” Hagiography exists as a style of propaganda that is used in the creation of mythology that informs a given society. A brief stroll though history will give you an idea of where I’m going with this premise. Early works that created a mythological view of the military “great man” as the shaper of history can be seen in still pertinent writings of “poets” from two widely different cultures. In Greece we have the works of the “Iliad” and the “Odyssey” attributed to the poet Homer. This greatest of Greek poets is said to have lived about 850 BCE and he writes of a golden era of heroic Greek history, thought to be the 12th Century BCE. Thus his writings are of a similar era to the “Torah” and from the study of mythology would seem to be part of a common thread in the development of civilization. In the “Iliad” we have the story of the Ten Year Trojan War. While there is indeed some evidence that this “War” actually took place in some form, obviously the “Iliad” is not to be construed as an accurate retelling of history. What is of significance, however, is that it became a formative tale of the Greek people and its heroes shaping the mythology of the burgeoning Hellenist civilization. The central Hero of the Iliad is Achilles. Achilles was so powerful a fighter that his absence, pouting over a slight, throughout most of the siege of Troy, prevents the massive Greek army from overcoming the Trojans. The Trojans greatest hero is the noble warrior Hector. Hector’s killing of Achilles best friend draws Achilles to battle, where he kills Hector and thus the ill fate of Troy follows. To simplify the mythological implications from this epic tale we can say it is the example of a “Great Man” shaping history for mere mortals. From India, thought to have been written in the 8th Century BCE, comes another great epic story that through its mythology shaped the sophisticated civilization there. “The Mahabharata” also gives an heroic account of a epic war that ended an dynasty and a age, shaping future history. Like the Greek works it is the battles of “Great Men” who shape the climax of this warfare and provide great victories. “The Mahabharata (Sanskrit Mahābhārata महाभारत, IPA: [məɦaːˈbʱaːrət̪ə]) is one of the two major Sanskrit epics of ancient India, the other being the Ramayana. While I’ve actually read the “Bhagavad Gita” I claim no great understanding of the work except that it does glorify its larger then life heroes”. My knowledge of the Indian Cultural history is certainly not scholarly, but I can say that it is one of humanity’s greatest and oldest cultural heritages. We in the West never give it enough credit. My point though in mentioning these two magnificent works is that around the 8th Century BCE, throughout humanity a reshaping of how we humans viewed ourselves took place and transformed the foundational mythologies of human civilization into the one that is common today. At its base are “great/heroic” men, whose deeds shape our lives and whose fame derives from the wars they participate in. The use of this mythological meme is such that through history the mythology surrounding the “great man” has allowed those perceived as that type of ”hero” to grasp, or come close to grasping power in our world. A smattering of great names from history will reveal this tendency to mythologize the “great man” and allow the reader to see how similar this plays out throughout our world. Julius Caesar used his fame as a military leader to vault himself to the top of the Roman Empire. Constantine the Great followed a similar path. William the Conqueror, Henry V, Napoleon Bonaparte were the recipients of hagiography in their own and later times reinforcing this heroic image. In America, George Washington, became our first President because of his generalship. Andrew Jackson won “The Battle of New Orleans” two weeks after the war had ended. William Henry Harrison, a man with little else to recommend him used the “Battle of Tippecanoe” to attain the Presidency. U.S. Grant used his victory over the South to become a rather undistinguished President. Teddy Roosevelt made his name as the head of the “Rough Riders” in the Cuba. Dwight Eisenhower’s leadership of the allies in World War II and the hagiographical reverence that followed made him President. In truth not every military hero actually succeeds in attaining the high offices they seek and we can see Douglas McArthur, a hagiographic hero if there ever was one, ending his political rise in ignominy. Whether successful in grabbing power, or not, the same old theme seems to play out repeatedly in human history. The theme is the glorification of military leaders making them potential political leaders. My view of this is that it rarely coincides that a military leader would make a great civilian leader, but that the ages of historical mythmaking have conditioned much of humanity to think that these “heroes” are those best suited to lead us all. A common thread in this today, is the compulsion of the mainstream media, historians and biographers to produce hagiography’s portraying these leaders as for more heroic than they actually are. With our modern media this glorification of people has accelerated far beyond the accomplishments they have actually had. We saw this especially clearly after 9/11. Such was the anger and fear engendered within the people and the “press” that we all longed to avenge ourselves against the “enemy”, which began as Osama Bin Laden, but morphed into other countries, one of which had no involvement whatsoever. While we expect wisdom and insight from our pundits and our press, we instead had them play stenographer to whatever Administration source fed them the propaganda of revenge. In a “good” vs. “evil” drama, portrayed simplistically as “The War on Terror”, the old human tendency to ennoble “heroes” to give substance to the “plotline” ran rampant. Thus Rudy Giuliani, a highly flawed individual whose popularity was at its nadir before 9/11, became “America’s Mayor” although all he really did was his expected job and in truth he did that badly. This brings me to General David Petraeus. In his military career he had experience all over the world, wherever there was a conflict that had U.S. involvement. While a review of his career history shows that he was no doubt well-known in military and government circles, it was the second Iraq War that catapulted him into the spotlight of public recognition and made him a hero in the eyes of most of the public and especially our mainstream media. “In 2003, Petraeus, then a Major General, saw combat for the first time when he commanded the 101st Airborne Division during V Corps’s drive to Baghdad. In a campaign chronicled in detail by Pulitzer Prize-winning author Rick Atkinson of The Washington Post in the book In the Company of Soldiers, Petraeus led his division through fierce fighting south of Baghdad, in Karbala, Hilla and Najaf. Following the fall of Baghdad, the division conducted the longest heliborne assault on record in order to reach Ninawa Province, where it would spend much of 2003. The 1st Brigade was responsible for the area south of Mosul, the 2nd Brigade for the city itself, and the 3rd Brigade for the region stretching toward the Syrian border. 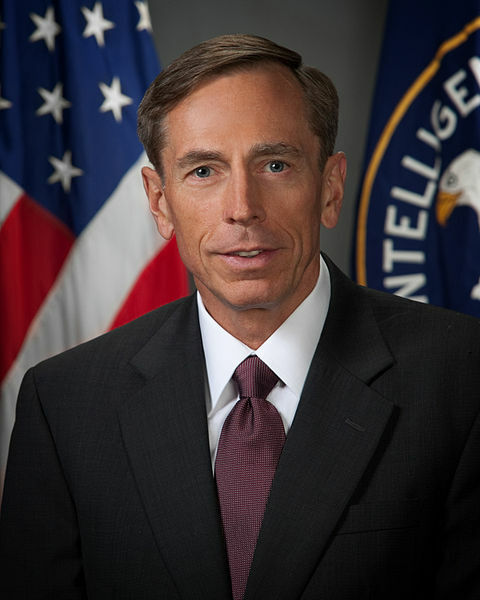 An often-repeated story of Petraeus’ time with the 101st is his asking of embedded The Washington Post reporter Rick Atkinson to “Tell me how this ends,” an anecdote he and other journalists have used to portray Petraeus as an early recognizer of the difficulties that would follow the fall of Baghdad. The General’s counter insurgency work in Mosul brought him media fame. He was a perfect candidate for hagiography given his brilliance, charisma and eagerness to give interviews. He appeared on “60 Minutes”, was featured in “Time” magazine and received many accolades from the adoring media pundits. As we remember the morass in Iraq, with its frequent bombings, deaths and terrorist activity, our media needed to find a hero to justify what was becoming an obvious debacle. The Bush Administration also needed a heroic figure to distract from the fact that this War was an inappropriate response to 9/11, which had killed hundreds of thousands of Iraqi’s and thousands of our troops. When it became apparent that there were no “weapons of mass destruction” in Iraq, we then received a justification from another hero “created” by another dubious war, Colin Powell and his famous “Pier One” rule: “If you break it, you buy it”. So Petraeus led the “surge” and we declared victory, while Iraq remained in chaos. Petraeus fame grew, ably assisted by his canny way of dealing with the media and the media’s tendency to produce hagiography, rather than reality. “Petraeus had a strategy to influence military conditions by using the press relations effectively in the theater and in Washington, according to critics who assessed the general’s military career after his fall from power. On November 13, 2012, Lawrence Korb, Ray McGovern, and Gareth Porter appearing on Al Jazeera English assessed the general’s extensive military-media strategy linking his writings on counterguerrilla operations and subsequent military media efforts to his downfall with a female biographer. Critics observed that the Petraeus media strategy would prove damaging for American policy in the future because of the omissions and distorted interpretations that Washington policymakers, other experts, and the American public accepted from the highly effective Petraeus media contacts. Sometime in early 2012 the FBI became aware of Petraeus’ affair with Mrs. Broadwell. The information finally reached the Administration’s Executive level in the fall. Petraeus met with President Obama and gave his resignation on November 8, 2012. The rest is history, so they say, but do we understand the true history. Do we know that this was only about an extramarital affair, with a woman who went overboard in jealousy, or was there more threatening things in this story for the U.S. Government? “Was the ambitious General David Petraeus targeted for take-down by competing interests in the US military/intelligence hierarchy—years before his abrupt downfall last year in an adultery scandal? Until now, the consensus has been that Petraeus began an affair with his biographer, Paula Broadwell, in the fall of 2011, after he retired from the military and took over the CIA”. There are some very significant details revealed above. The first is that if the affair was carried on when Petraeus was still in the military then he was guilty of an offense that should lead to a Court Martial. It is against military law to commit adultery and many an enlisted man has actually been court martialled and imprisoned under that law. More importantly though is the allegation of Petraeus including a woman, possibly Broadwell, in what were essentially diplomatic talks held in a social situation. The story goes into many key situations in which Yemen is involved as a foreign policy broker. The details provided in this article are much greater than the snippets I provide above. I would suggest that people read it in its entirety to see the possibly grave implications in this story that go the heart of U.S. foreign and military policy. Implications of this go to the known wish of some in the Republican Party who saw Petraeus as a “can’t lose” Presidential candidate and to the internecine warfare that goes on in behind the scenes in our government and whether Petraeus was “taken out” by elements of the Military. To my mind the Petraeus story is yet another instance where hagiography becomes propaganda and then morphs into mythology. While Petraeus indeed had some successes in the positions he occupied, none of those “successes” were remarkable and many of them were examples of hagiography by the mainstream media, gone wild. Why this military man would actually be considered as Presidential material escapes me, except from my knowledge of this being a repeated theme in world history. Humanity’s history is one of warfare and brutality and yet we glorify those who lead it and make them into almost “Olympian Heroes”. As long as we lionize and overprize those with skill at killing people en masse then we will also remain a species at war with itself. @BettyKath, you’re right. I didn’t think it out completely. Speaking of medal-encrusted military uniforms — a sure sign of Commendation Accumulation Syndrome run amok — just think of the really cool new one here. That’s a lot of words to essentially repeat what I already said in a much more succinct manner. Here are some fact scenarios wherein that statement seems to be valid to me. 1) (“Hagiography is a tool of propaganda”) A propagandist is working on a PR project involving Bishop X. They run into a snag because of some of the public record. The only way around it is the sainthood of Bishop X. The propagandist decides to include some text or other information that is not historically supportable, yet the material moves the sainthood process along because the sainthood of Bishop X has a very good PR goal — because Bishop X is extremely popular within the believer and other communities. 2) (“Hagiography … also precedes propaganda”) A hagiographer is working on the sainthood of Bishop X. Everything is going fine until the hagiographer runs into a snag, because of some inferences in the public record. The only way around it is some propaganda to cleanse or gloss over the blemish in the public record. The hagiographer engages a propagandist to include some text or other information that is not historically supportable, yet the material will move the sainthood process along to the final goal. This propaganda effort is determined to be doable because Bishop X is extremely popular within the believer communities, and the press is lazy and weak at the moment. Basically, the sequence does not have to be one or the other (hagiography, propaganda) going first in a sequence. Under various circumstances, either one can go first, the other second. Either way, it leads to myth. The resignation of the Pope may just involve some reflection on Heroic Hagiography. One reason is that “The Prophecy of The Popes” predicts that the next Pope will be the last one because it will end with the destruction of Rome itself. Saint Malachy (Middle Irish: Máel Máedóc Ua Morgair; Modern Irish: Maelmhaedhoc Ó Morgair) (1094 – 2 November 1148) was an Irish saint and Archbishop of Armagh, to whom were attributed several miracles and a vision of the identity of the last 112 Popes (see Prophecy of the Popes). He was the first Irish saint to be canonised by a pope. (Wikipedia). One wonders if hagiography existed when he was sainted and whether the prophecy of the last Pope, which is the next Pope, was considered. I mean, think about it, Pope anoints a saint, and that saint prophecies about the last Pope hundreds of years in the future. I had intended to mark my first two comments as “OT”, but didn’t… Sorry to have veered off the track. Thanks for the redirection to the appropriate thread. So did anything come up about the idea of a get together as we discussed on another thread? Dredd, you are a persuasive devil. Now I am going to have to get out the plastic and spend money. I am easily tempted when it comes to coffee. I must issue a disclosure: I am not involved in any way with Gene Hicks. If you buy anything from that place you have assumed the risk on your own. I am contemplating the issue and will comment later. Why it intrigues me about the sequential progression you asserted is an interview of the linguistics (not languistics) genius Chomsky which I was reading when I passed back through this thread. Language is far more than what is reduced to dictionaries, even though dictionaries are invaluable.